Curtains, tapestries, drapes, couches, sofas, and all padded furniture can serve as the beautifying centerpieces of any room, but they can also serve as collection points for dirt, dust, and other allergy-causing particles. Proper maintenance of your upholstery can keep it looking and smelling brand new. Thanks to Clean It's thorough upholstery cleaning process, this responsibility is both quick and easy! At Clean It North Wales Carpet and Upholstery Cleaners, we specialize in restoring the beauty, vitality and original freshness of all your upholstered furniture. We use state-of-the-art cleaning materials that can safely and effectively wash even your most delicate upholstery including Haitian Cotton, Wool, Velvet and many other fabrics, including white and off-white fabrics that some conventional cleaners refuse to touch. Our technicians are fully trained and qualified and will remove those niggling spots and stains, without fading your furniture's original colours or damaging fragile stitches. Clean It North Wales Carpet and Upholstery Cleaners powerful upholstery cleaning service will leave your upholstery sparkling cleaning in hours. Over time and with regular wear, factory applied stain resistants will experience a reduction in effectiveness. Contact Clean It for advice on how to protect your upholstery against everyday dirt and stains. To book your cleaning appointment or to obtain a free quote, please Call 0800 781 0873 or use the online enquiry form at the top of the page. This uses a combination of cleaning solution and hot water. The solution dissolves and agitates dirt and stains we then pass over this with out Hot Water Extraction tool which thoroughly rinses the upholstery and extracts all dirt. This process is similar to Hot Water Extraction only it uses steam to break down and remove stubborn dirt and stains. With this method we are able to clean your upholstery without the use of water, using a powder, which breaks down the dirt. This powder is then vacuumed off leaving a clean and dry finish. 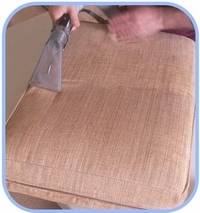 We have a number of methods for extending the life of your upholstery. As different upholstery uses many various types of fabric fibres, using the wrong cleaning process can potentially cause damage to your furniture. Worst of all, damage to your furniture might not be appear immediately and may become evident months down the track, making it difficult to claim damages from a second rate cleaner (should they be insured). Don't be caught out by a cheap alternative. To protect your furniture into the future select a reputable, qualified cleaner such as Carpet Attack.